Every year a lot of nutrients are taken out from soil with yield, and soil is tilled a few times. 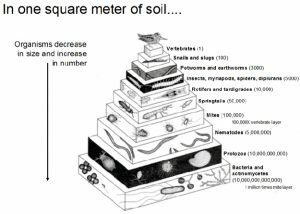 When soil is tilled, countless beneficial micro-organisms die, humus levels and overall soil fertility depletes over time. Without the right biology present in the soil, nutrients are wasted, erosion increases, and yield is decreased. Of course, farmer uses mineral fertiliser to restore the nutrients lost from soil, and immediate effect on plant growth can be witnessed. However, synthetic fertiliser cannot provide food for all beneficial micro-organisms, and it degrades the soil with formation of salts. As the time goes by, fertilisation becomes waste of money, because there is not enough biology to hold on to these added nutrients. Water courses are contaminated with leached nutrients, and it only adds problems. Every organism present in the soil plays important role in soil ecosystem, and a man should look after these organisms to ensure that the soil stays fertile, and less dependent on mineral fertilisers. Knowing that, a question arises: How to ensure high yield, while saving soil bacteria? The answer is rather simple: feed soil microbes and build good conditions for them to thrive. This can be done with Ecoworm HuMate. Ecoworm Humate feeds plants and soil micro-organisms, enriching soil with humic and fulvic acids, as well as plant growth enzymes. It also consist of macro and micro nutrients, minerals, vitamins, natural antibiotics, 18 amino acids, and beneficial soil bacteria. Ecoworm Humate captures a wide spectre of nutrients which come from fertilisers, and stores them until the plant is ready to take them up. Humate also unlocks many nutrients previously unavailable for plants. In addition, Ecoworm Humate improves soil structure, increases water retention capability, and creates best conditions for beneficial micro-organisms to thrive.